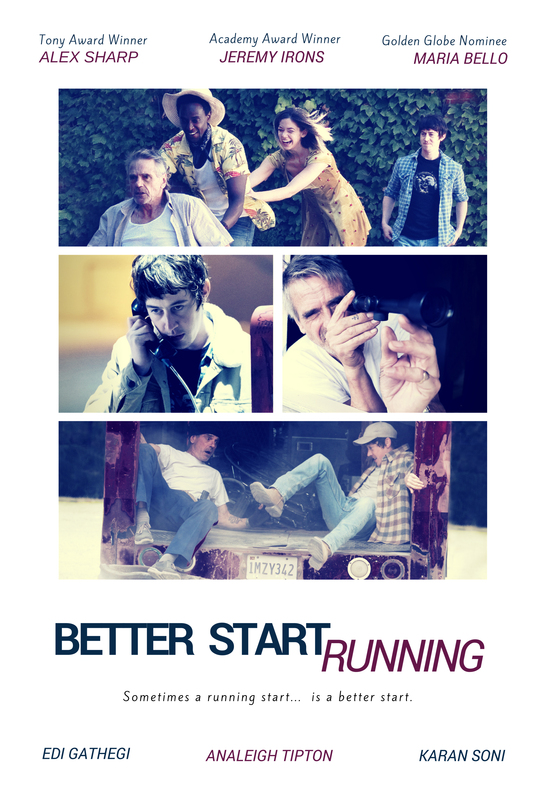 In BETTER START RUNNING, an unexpected series of events turns everyday store clerk Harley [Alex Sharp] into a wanted man - and even more unexpectedly, he finds himself on the run with the girl of his dreams (Analeigh Tipton). FBI Agent McFadden [Maria Bello] is determined to crush him and wants to teach her rookie partner [Karan Soni] how it's done. But while the agents pursue their culprit, our hero has loftier pursuits. He kidnaps his Vietnam vet grandfather [Jeremy Irons] to reunite him with the love of his life, picks up a try-hard beatnik hitchhiker [Edi Gathegi] with a secret of his own, and against all common sense follows a roadside attractions map with a mysterious history. As the agents get closer and closer with every stop, this eclectic band of misfits becomes an unlikely family, because sometimes a running start - can be a better start. An eclectic band of misfits becomes an unlikely family as they take a wild journey in the name of love while on the run from an overzealous FBI duo who wants them dead or alive - preferably dead.